Social conflicts may engender stress-related behavioural and physiological disturbances in the victims of aggression. In addition, stress-like neurochemical changes and ensuing depressive and anxiety symptoms might also be evident in the perpetrators of aggressive acts. The present investigation assessed basal levels of circulating corticosterone and of brain serotonin (5-HT) and norepinephrine (NE) in pre-identified submissive and dominant mice. In addition, brain neurochemical changes were determined following a single or three 15-min aggressive episodes both in submissive mice and in those that dominated the aggressive interplay. Three minutes after single and repeated confrontations, plasma corticosterone levels and 5-HT utilization within the prefrontal cortex (PFC) and hippocampus were increased to a comparable extent in submissive and dominant animals. Interestingly, however, NE utilization within the PFC and hippocampus was augmented to a greater level in submissive mice. These results suggest that 5-HT neuronal functioning was generally responsive to aggressive events, irrespective of social rank, whereas NE neuronal activity within the PFC and hippocampus was more sensitive to the submissive/dominance attributes of the social situation. It is possible that NE and 5-HT variations associated with an aggressive experience contribute to depressive- and anxiety-like manifestations typically observed after such psychosocial stressors, particularly in submissive mice. 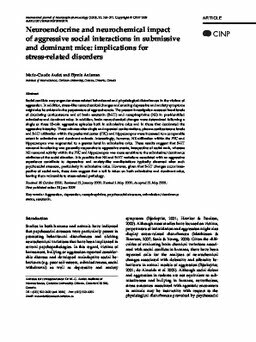 However, given that 5-HT changes occur irrespective of social rank, these data suggest that a toll is taken on both submissive and dominant mice, leaving them vulnerable to stress-related pathology.